The concept behind the Bricklin SV-1 was to create a safe and efficient sports for the masses. This tubbed and 482 BBC V8-powered SV-1 is none of those things, and yet somehow the coolest SV-1 we've ever seen. 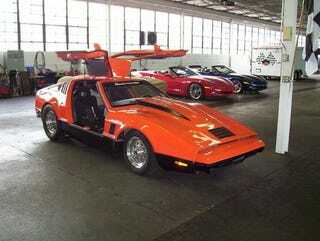 Let&apos;s Make A Deal For... A Bricklin! Here's the seller's description of the car, which probably ditched an already powerful 351 Windsor V8 for the big block Chevy. 1975 Bricklin Gullwing, Prostreet. Tubbed, 482 C.I. Big Block Chevy. Bow tie block, Aluminium Chevy Bowtie C-port heads, Steel 4" stroke crank, Solid flat tappet cam, Roller rockers. Over 600 HP. Turbo 400 trans with manual shift. Dana 60 Posi rearend with 373 gears. Morrison strut front suspension, Strange Coilover rear suspension with 4-Link.Four wheel disc brakes. Hoosier 18.50X29 radial tires on rear with 14X15 Weld wheels.Full MSD ingition. Custom 2 1/8 headers. 3" exhaust exits in front of rear tires. Less than 5000 miles since completed. Drove on Hot Rod Power Tour in 2009. Never been to the track/ Street driven. All Acrylic body except for the cowl induction hood and the Hatch. Extra Acrylic hood with Shaker Aircleaner is included with car. Fiberglass front and rear bumpers. Air doors with electric compressor. Car was fetured twice on the cover of the Bricklin International magazine The Brickline July/2005 and October/2006. All Chassis work was completed at Advanced Creations In Michigan. Four point roll bar. Runs on premium pump gas, 10 to 1 Compression. And the best part is, should you lose your house after buying the SV-1, you can always live inside the rear tires.